The last couple of seasons it’s been all about the solid color coat in all forms – pea coat, overcoat, nylon. But I love the idea of bringing some pattern back into outerwear. I love the idea of it especially in the context of those big, plaid coats – with shorter sleeves, and at a hip length and no longer – but the most important thing is to have some sort of nipped waist (see above); without it you look like some sort of giant square. Even if it doesn’t come with that kind of silhouette, it’s reasonably easy for any tailor to add a dart in the back, as you would with a shirt. This would look amazing on a handsome man! Haha I agree with Antonia! I am very happy to see the plaid trend keeping alive for another season. I have noticed some plaid coats in Copenhagen now that our summer is over. It is nice to see some bold patterns for a change. My preference would be towards something a wee bit more understated, like herringbone, but it is a breath of fresh air all the same. Digging the one on the right…anyone know where/what/who? They look wonderful! My love for plaid returns each year in early August and slowly builds up to Christmas, and ends on January 1. To me plaid symbolize warmth, tradition and “cosyness”. You can´t be bad if you´re wearing plaid! Some ideas to find this type of plaid coat ? Fabulous plaid! perfect for winter and soft in our bodies! Oh, yes, a man in a nicely cut plaid jacket is good old-fashioned handsomeness. Agree with Erica, the plaid coat to the right is very elegant ! Some ideas to find this type of plaid coat ? I think these look great because they are so comfortable!!! And they are so smart casual!!! Love them! The blue plaid coat looks even elegant because of the nipped waist. I would love to steal these plaid jackets to my man! The one on the right looks awesome! Plaid is the way to go especially on a pea coat. Fashion is cyclical as history, every few years, the old trends come to life and become role models with passion. What trend will continue next winter of 2012? Remembering the plaid shirts from long ago! I love plaid coats but wish they made in newer, more fun colors. I’m originally from Wisconsin. These coats do not bring back good memories, handsome man or not, ick. Perfect silhouette. Certainly, if they were squared coats it wouldn’t be nice. 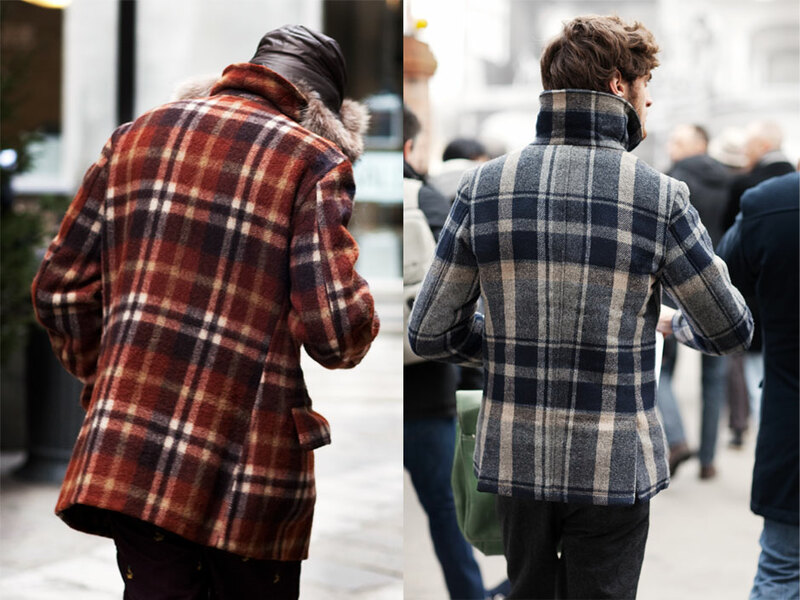 I prefer bold or herringbone patterns for a coat, but still, it ¡s an interesting pattern (especially the one on the right). Plaid is definitely a must this season. I like how you juxtaposed these two photos and how both subjects have their collars popped. What’s wrong with looking like a giant square? I rather like perpendicular lines in an outfit. Great for countries with 4 seasons! Events would be a great excuse to wear this in Singapore. I would love to own one too! Seems like you’re gonna do a whole lot of fall shopping! Can’t wait for some fall-streetstyles! Very nice! Great shots Scott. 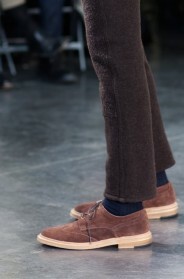 As a tailor, I can tell you most definitely a personal silhouette can be achieved if the coat is bought boxy, the cost depending on the severity of the change. Any one reading can visit a local tailor to see how they can help. What’s great about these large plaid patterns is the versatility with proportions, if the fit is balanced, it can look great on most anyone, given the colors work with their skin tone and personality. Oh, I love the idea, maybe hard to find here in Europe, even in vintage stores? It seems like more of an American thing? this post reminds me of the beautiful plaid jacket i saw that day but i was in a rush and couldn’t go back to the trial room! I’m gonna buy one for my BF! I love plaid for the fall….. its a nice change for the season! I LOVE to see these style jackets! They are always a winner! But please be sure the plaid matches at the seams!! Those coats are so stylish and smart! I love how they fit… WOW! Honestly I’m not a super fan of plaid coat… but at least it has to be fitting: super sized ones (and I see a lot around) are simply awful imo. I’m dying to know where the blue plaid jacket is from. Does anyone know? I like the one on the left best–it’s roomy enough that it looks like a functional coat but is still clean-lined. And that fabric looks warm and cuddly. Dying to know that too! It looks really good. I want one! This photo sent me on a three-hour search for a jacket similar to the one on the right. Someone please put me out of my misery. Immediately brought to mind my parents college photos from the late 50′s. Looks great. The one on the right was from last Falls Scotch & Soda collection…..I wore mine to death last year, and have had it in storage since! I’ve just bought a vintage Woolrich red & black plaid one, and am now waiting impatiently for the weather to turn colder! Scott, please find out where the coat on the left came from. i need it. thanks. please say this is not in NY yet. season pushers ? it is very hot here still. nicely cut plaid, but don’t PUSH too hard yet, for the love of credibility. Anybody any idea if the coat on the right is still available anywhere?